Rational Requirements Composer provides a complete requirements management capability to define and capture business needs and manage all requirements throughout a project lifecycle. It fosters better business and development collaboration in an online agile requirements community, involving a wide set of stakeholders that can include customers, analysts, developers, testers, and anyone involved in operations and production. Rational Requirements Composer (RRC) uses the Requirements Management (RM) application of the Collaborative Lifecycle Management (CLM) solution, which includes the Requirements Management capability. This capability provides tools to capture, organize, and collaboratively review, analyze, and report on requirements, especially in relation to their associated development work items and test artifacts. RRC 4.0 contains significant new function as well as enhancements in many areas of the product compared to RRC 3.0.1. The goal of this article is to give guidance on how RRC 4.0 performance compares to 3.0.1 with equivalent hardware and workload. We will look at different user loads and data volumes. This document covers the results of the scalability and performance tests conducted in a RRC-only deployment. For information on integrated CLM deployments refer to the Collaborative Lifecycle Management 2012 Sizing Guide on jazz.net. Additionally, this document provides recommendations for optimal performance. The performance tests were conducted in our in-house lab taking into account the various topologies and most of the complexities involved in a large scale deployment of the product. The performance test environment consisted of an LDAP Server, Token License Server, database server, reporting (RRDI) server along with the Requirement Management (RM) and Jazz servers (JTS). 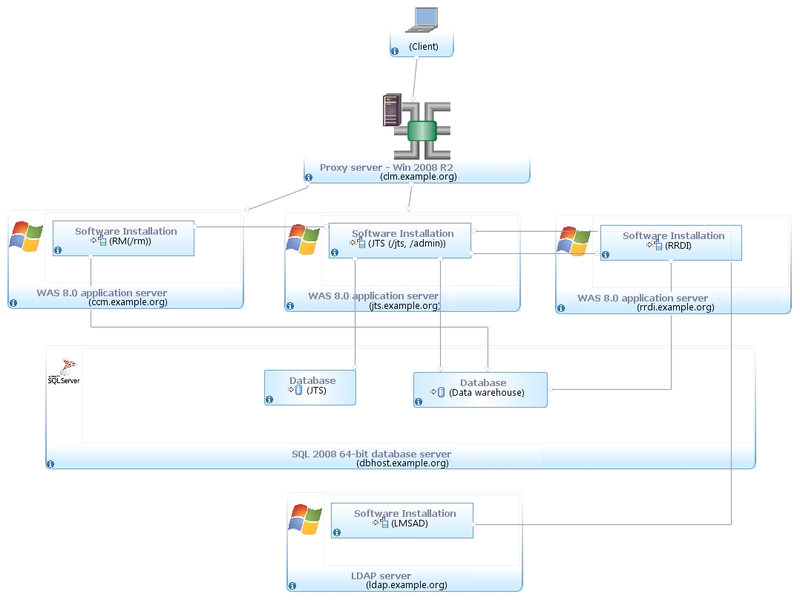 We tested using a distributed environment with the JTS and RM server applications split into two servers see figure 1. The table lists the hardware used in the testing performed. All hardware is 64 bit. Rational Performance Tester was used to simulate the workload. Each user performs a random use case from a set of available use cases. Based on real customer use, our test scenario consists of a ratio of 70% reads and 30% writes. The users execute use cases at a rate of 30 pages per hour per user. Each test runs for 60 minutes after all of the users are in the system. Connect to the server using server credentials. Execute a query with 100 results and Open 3 levels of nested folder. Open requirement with 100 comments and raises a comment to 8 people in the team. Open the project and dashboard both for the first time and cached after opening it. Create a requirement with a table, image and RichText. Also edit an artifact with 100 enumerated attributes and modify one of them. The number of comments and links are much higher here than in the 3.0.1 test data due to differences in the way the test data was generated in 4.0. The number of folders is slightly lower than for the 3.0.1 tests. In addition to the 200,000 artifact data above we also tested with a 100,000 artifact repository. 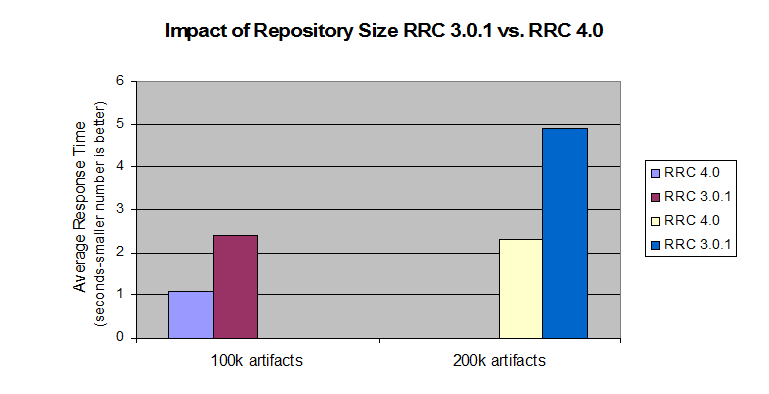 RRC 4.0 shows significant improvements in the average response time compared to RRC 3.0.1 for both repository sizes. For the 100,000 artifact repository the average response time was 1.1 seconds in 4.0 vs. 2.4 seconds in 3.0.1. Average response time when using the 200,000 artifact repository is now 1.4 seconds compared to 4.9 seconds in 3.0.1. This demonstrates that scalability has improved dramatically from 3.0.1. Use cases with the biggest improvement are folder operations (viewing contents, creating, moving), create comments, open artifacts including graphical artifacts. 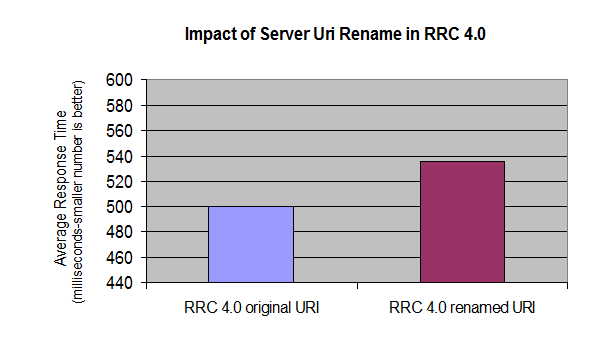 The ability to change the public URI for RRC and JTS is a new feature in the 4.0 release. Our testing after renaming both the RM and JTS server URI showed only minor performance degradation vs. using the original public URI specified during setup. The performance degradation we observed amounted to 7% for the average response time. For logistical reasons the server rename test was done on different hardware from the 3.0.1 vs. 4.0 test above. The numbers are lower overall and not comparable to the 3.0.1 vs. 4.0 numbers above since the server used for this rename scenario was on faster hardware. By using the performance test data that we compiled, we created the tables that follow, based on the various hardware and software configurations for optimal deployment of Rational Requirements Composer server. When considering sizing options, Version 4.0 supports both dual and multitier configurations. The increased CPU load on the combined JTS/RM server limits scalability to higher user load in a dual tier toplogy. The following recommended topologies reflect this. The three lists that follow show the sizing for different enterprise deployments. The database server hardware other than disk storage does not impact RRC system scalability significantly. The same hardware recommendation applies to small and large scale deployments. See the disks and disk space discussion below for details on storage recommendations. Choosing network connectivity in dual-tier configurations is to minimize latency between the application server and the database server (no more than 1–2 ms), with the servers located on the same subnet. When using external storage, minimize connectivity latencies (the optimal configuration is through a Fibre Channel). Based on the performance test results, we found that an increase in repository size along with increase in concurrent users causes significantly more load on the hard disk storage system. Therefore, for storage for large-scale deployments, consider a SAN or NAS solution with the storage directly connected through a Fibre Channel (FC) connection to avoid latency between the storage and the server. The benefits of using this configuration will allow offloading all disk I/O from the server to the NAS, while providing a complete fault tolerance disk subsystem with instantaneous snapshot backup capabilities and high availability and disaster recovery capabilities. The disk space usage for the Rational Requirements Composer server is composed of the disk space used for the Rational Requirements Composer index data and the disk space needed for the database instance. By default, the indexed data is located on the same machine as the JTS application server. Therefore, giving consideration to adequate disk space is important. For example, for our windows repository loaded with 100,000 Rational Requirements Composer resources, the indexed data takes up 9.25 GB of disk space. The database instance must be located on a server that also has appropriate disk space. For example, the database that housed 100,000 Rational Requirements Composer resources amounts to approximately 20 GB of disk space. The default number of TCP/IP ports available on AIX and Linux operating systems is too low and needs to be increased. Windows has a higher default limit but it may still be too low for large concurrent user loads. Use the instructions below to increase the port range. Windows 2003 Server: Open the registry. Under HKEY_LOCAL_MACHINE/SYSTEM/CurrentControlSet/Services/Tcpip/Parameters, create a new dWord named MaxUserPort , and set its value to 65000. Restart the computer. The WebSphere Application Server thread pool size needs to be increased from the default 50 to 1.5 times expected user load. For 200 concurrent users the thread pool maximum should be 300. The WebSphere Application Server JVM heap maximum should be set to 4GB if the machine has at least 6GB of RAM. If the server machine only has 4GB RAM (not recommended) a maximum between 2GB and 3GB needs to be experimented with. Never set the maximum heap size to more than 70-80% of the maximum available machine memory or you will see poor performance. com.ibm.rdm.fronting.server.connection.max – should be twice that value. When using a proxy/reverse proxy server the maximum allowed connections on the proxy server may have to be increased based on the concurrent user load. Refer to the IBM HTTP Server tuning recommendation for more information. To ensure optimal database performance, it is necessary to ensure that the database is fully optimized. With both DB2 and Oracle, you can run statistics to allow the databases to analyze the shape of a schema and optimize the contents. Databases generally manage statistics automatically (in a scheduled overnight operation, for example). However, to ensure that the database is fully optimized you may manually run the statistics as follows.